Founded in 1967 Revolution Wheels first launched its 13” 4 Spoke design to meet a growing demand for light weight race & rally wheels capable of meeting the demands of cars of the period. 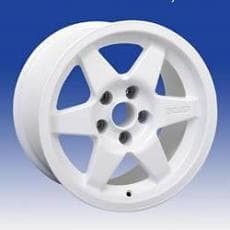 In the 1970’s the company added a 5 Spoke design as demand increased for 15” wheels for tarmac rallying. Modular wheels were also introduced during this period. The RFX Retro design was launched during the 1980’s specifically targeted at the growing front wheel drive market which developed into a four wheel drive market during the 1990’s. The RFX Retro range developed from a 13” wheel all the way up to a 16” during this period. 2000 saw the introduction of the Millennium range in 15” to 18” sizes as larger wheels were now required with higher offset ranges & greater brake caliper clearance. 2010 welcomed the companies first flow formed wheel in the form of the Millennium II which was enhanced with all the latest FEA & FEM design technology. We are very proud of our heritage, since the company’s inception we have supplied our products to most of the world’s leading race & rally teams as well as world champions such as Colin McRae & Stig Blomqvist & national heroes such like Jimmy McRae & Bertie Fisher to name a select few. The company still offers its iconic 4 Spoke, 5 Spoke & RFX Retro designs today alongside its other designs all of which have evolved to incorporate the latest wheel technology available today.